the-main-mouse-warehouse has no other items for sale. Sales tax may apply when shipping to: IA*, MN*, UT*(7.6%), WA*. Would definitely do business with again! I use to belong to a film club and purchase and show films in the house. I came across this title and bought it and enjoyed it immensly. The Technicolor and the amount of drawings to accomplish the complex display on the screen were very impressive. I later found out that the Disney Studio's were in financial problems and this was the last in a series of features that contained several songs and stories. I was very impressed by the amount of color and live action with Donald Duck and Ethel Smith at the organ sequence. And who does not like Roy Rogers and his horse Trigger and the Sons of the Pioneers. It is very enjoyable short feature with a variety of items to please most people. 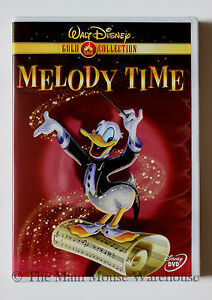 MELODY TIME, one of the three Disney DVDs of animated music (or four, if you count FANTASIA). Most of it is animated, that is. For some reason, Ethel Smith is there in person, playing the organ for one piece (“Blame It on the Samba”), and Roy Rogers and a cast of too many are around for “Pecos Bill” segment. Some are very clever; some are drawn out way too long. There are three bonus cartoons, “Casey Bats Again,” “Donald Applecore” and “Lambert, The Sheepish Lion,” amusing single entries not from the movie. Most of the creations work. (Donald Duck, as always, is totally unintelligible.) Voice talent isn't mentioned in the shorts. It's strange that Donald Duck is the sole figure on the cover of the DVD case, since he appears only in one of the bonus features and not in the movie itself. Still, it's a piece of Disney history and certainly well worth buying and watching. This Walt Disney classic goes back to my fondest memories from childhood. As a child, I had a set of 78 rpm Disney records telling the story of "Johnny Appleseed" and played them until worn. It was wonderful to see the original classic animation on this DVD that went with it. The character voices were provided by Dennis Day. There are seven other animated musical shorts on this DVD. "Bumble Boogie" is a very upbeat jazz version of "The flight of the bumble bee". There is the story of "Pecos Bill", and many other delightful stories. The musical talents in these classics include Roy Rogers, and the Andrew Sisters. This is family entertainment at it's best in my opinion. 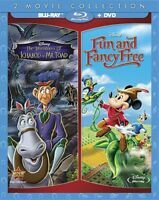 Kids will love the animation, Adults like me enjoy the memories of a bygone era when music, animation, and classic stories were Disney's mainstay. I bought this DVD just for the Johnny Appleseed portion. I remember watching this in grade school and I loved it. It was one of my favorites that we used to always watch along with the "Im no fool" series with Jiminy Cricket. This is a classic when God was actually still allowed in school and we had prayer every morning with the pledge of allegiance. This movie references going to heaven, praise to the Lord with a song "The Lord is good to me", a guardian angel, and Johnny Appleseed is portrayed as a vegeterian. I cant wait to watch this with my granddaughter. Im surprised that it was still available do to its religious references. An awesome video..you will love it.